For a few years we only had a matte canvas which has been incredibly well received. We currently use the Fredrix by Sunset Matte Canvas which was just recently certified by Wilhelm Research. For those that are not familiar with Wilhelm, they are considered "THE" authority in determining how archival a particular paper or canvas is. 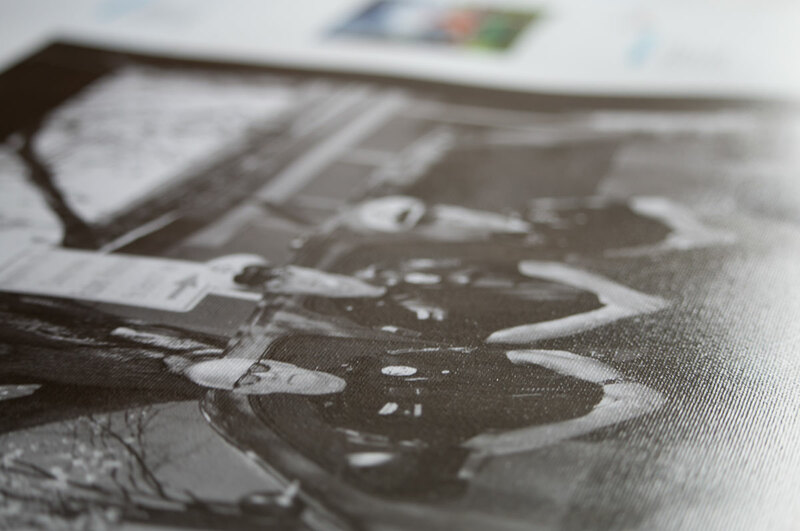 According the the Lexjet website, the exclusive provider of this canvas, the prints we produce on our Canon imagePROGRAF printers are capable of lasting more than 200 years if prints are framed with a UV filter. Color labs which might be using newer Epson printers (tested with UltraChrome HDR pigment inks on an Epson Stylus Pro 9900), prints framed with a UV filter will last more than 130 years. The problem we have had with this canvas has not been the color accuracy and quality but the fact that those looking for a glossier canvas were sort of out of luck. To help, we resorted to applying a glossy liquid clear coat for those opting for the gloss canvas and a matte liquid clear coat for those wanting a matte finish. But while applying a glossy coating to a matte canvas helped some, it just did not have the "pop" photographers seemed to be looking for. So, to better server those photographers and even artists that want a higher dmax (deeper blacks) and crisper look, we now offer the Sunset Select Gloss Canvas. While it has not achieved the Whilhelm Research certification (few canvas brands have) it has received the 2009 and 2011 Hot One Award winner. For those not familiar with the Hot One Award, it is an award granted by Professional Photographers Magazine via a panel of judges made up of photographers. According to Lexjet, the exclusive provider of this canvas, the "Sunset Select Gloss Canvas is suitable for all types of photo printing and art reproductions but is a particularly good choice for wedding, portrait, and landscape photographers who need an exceptionally high level of detail and tonal range in their photo enlargements on canvas. The water-resistant, poly/cotton blend canvas is ideal for gallery wraps and other display options, and the pH-neutral, acid-free coating ensures consistency and repeatability from print to print. Sunset Select Gloss Canvas features an instant-dry, microporous coating that works with both dye and pigment inks and is compatible with current and legacy-model printers from Canon, ColorSpan, Encad, Epson, HP, Mimaki, and Roland." I was thrilled with the first test prints we did. The level of detail, sharpness and crispness is stunning. One of our first customers of this new canvas was the Schertz Police Department, located in the San Antonio metro region which ordered about a dozen large canvas prints showing officers engaged in their day to day duties to deck the halls of their police headquarters. They were all printed in black and white, stretched and mounted on our thick stretcher bars with black sides. The new gloss canvas is also coated. 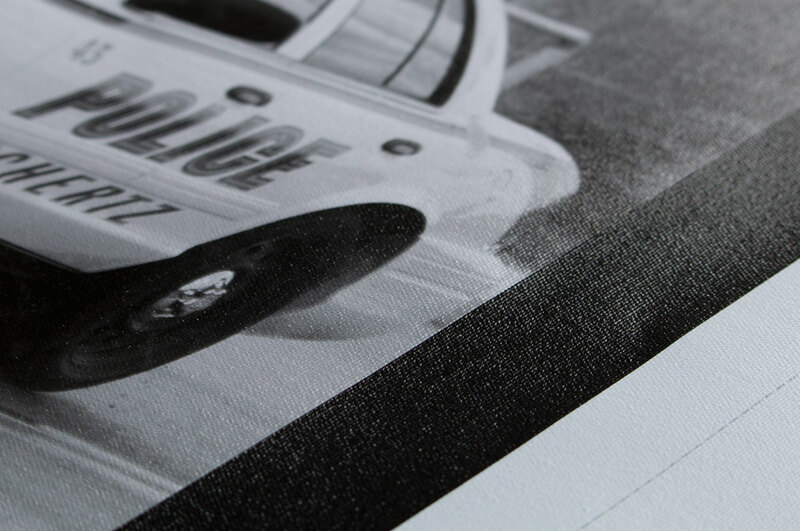 It uses the same gloss coating we applied to our matte canvas so the inks will be well protected. For those interested in soft proofing before ordering, we have also posted the media profile for it. Let us know how you like the new gloss canvas if you ordered one recently and be sure to order one of our sample kits or tested it out yourself. I know you will love it.